We first learned of Amanda and her pit bull Jada’s plight when, on April 23, Amanda e-mailed Atlanta Underdog Initiative looking for help. Amanda and Jada are homeless; they had been staying with a friend but had to leave the next day. Amanda had saved up enough money to buy a train or bus ticket to take her to Pennsylvania, where a friend would take her in; however because the friend has two cats, Jada would have to be boarded. The only problem was, the train and bus companies would not allow Jada to accompany her. 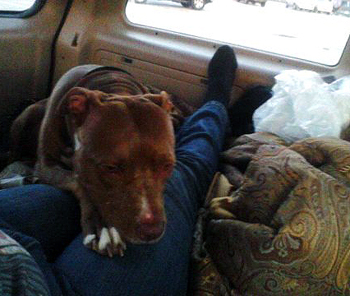 Jada had pretty much saved Amanda’s life, and she would rather be homeless than give up her beloved Jada. About seven months ago, Amanda was working in her brother’s yard. Since the yard was not fenced, Jada was tethered outside with her. A Boxer came out of nowhere and attacked Amanda. 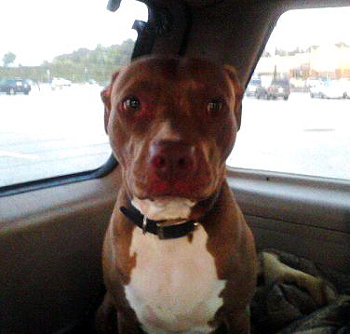 Jada, being the loyal pit bull that she is, broke her chain and went after the Boxer. The Boxer eventually ran, Jada sustained minor injuries, but Amanda’s right knee was ripped open. She received 13 stitches and because they never found the Boxer after it ran, she had to undergo painful rabies shots. I’m sure you now understand why this brave young woman will not give up her dog. Ami Ciontos from Atlanta Underdog Initiative posted about Amanda on the Atlanta Pit Bull Parents Facebook page. Immediately members were posting wanting to help. (All the people who have helped are part of Stubby’s Heroes – an activist and advocacy group that grew out of Atlanta Pit Bull Parents.) Within a two days one member had set up a ChipIn, and by the next day almost $700 was raised to help care for them both. Also within those two days, members contacted their “pit bull friends” and arranged transport to get Amanda and Jada to Pennsylvania on April 30. But by this time, they were already living on the streets. They walked around a park in the blistering Atlanta heat all day, and at night they slept in her ex’s truck, which was parked in the parking lot where he worked. It was a horrible situation. Another member checked on her daily and took her food and water. On April 26, another member offered to take Amanda and Jada in until they left for Pennsylvania. They have their own room with their own full bath! After spending time with Amanda, it was decided that moving to Pennsylvania might not be the best choice. Amanda would not have the support there that she does here in Atlanta with the members of Atlanta Pit Bull Parents. Thanks to the ChipIn donations, Jada was taken to the vet on Saturday and received a clean bill of health! She was fully vaccinated, and she tested negative for heartworm. She was also microchipped. Everyone that meets her falls completely in love with her. She is the most adorable personality! Because there are dogs who are dog selective living in the home that Amanda and Jada are currently staying in, it’s a rather stressful situation for all. They’ve been able to keep the dogs separated, but some of the dogs that live there are becoming pretty anxious because of Jada’s presence. Homeless shelters were contacted, but there is no shelter in metro Atlanta that allows a person to bring their dog with them. Amanda and Jada cannot be separated. They are each other’s lives. Jada is Amanda’s shadow. They’ve been through so much together; I’m not sure Jada would survive if she were taken from Amanda. Of course, members of Atlanta Pit Bull Parents once again are coming to the rescue! There is another member that may be able to take Amanda and Jada in until she gets on her feet. She has also contacted a woman that she knows who has a small apartment available, and she may also be willing to take them in. These homes are also close to retail stores and the bus line, which will make it much easier for Amanda to find work. We aren’t sure exactly how Amanda and Jada’s journey will end, but we do know that because of the amazing network of pit bull people, they will be safe and they will be able to stay together. Reading this has given me the chills. God is so AWESOME & so are those in the Atlanta area. Can’t imagine the agony Amanda is going through. Amanda & Jada are in my prayers. Amanda you’re not defeated this is only a test. @theprettychic. I feel the same way. God is bigger than all this. You and Jada are both loved. I live outside Atlanta and the pit bull community here is full of wonderful, caring people. They are the angels among us and I feel privileged to know them and to be able to call many of them my friends. @JoanMurphySnow Thanks Joan, we also feel privileged just to bring our fans the story of how a community can truly help. I wish them both the best…they’ll get through it together! I wanted to share another similar story I found. It shows the hearts of animal lovers the world over. @DianaJones Thank you Diana, it just shows how we all can make a difference if we work together for the welfare of people and pets. A man I know named Terrance, who was an animal control officer where I live moved to that area. Terrance is a pit bull person through & through. I can try to locate him for you if you want. I know a guy in that area who’s a pit bull person through & through. A man named Terrance from the Twin Cities area in Minnesota. Terrance was an animal control officer in my community until he moved down there to be closer to family. Terrance called my angel “Happy Herman”. A guy named terrance was an animal control officer in my community who moved to Georgia to be closer to family. He’s a pit bull person through & through. He’s a great guy. He’d just adopted a pit bull puppy from the animal control center where he worked when he moved. Herman adored him. Terrance called him “Happy Herman”. It’d be quite a coincidence if he were somehow involved in one of the rescues helping out. Terrance, one of Herman’s best friends and a pit bull person through & through, was an animal control officer in my community who moved to Georgia to be closer to family. Be quite a coincidence if he was with a rescue helping with this. These baths allow people to walk into their baths and sit down, allowing them to bathe with dignity and in comfort and safety.